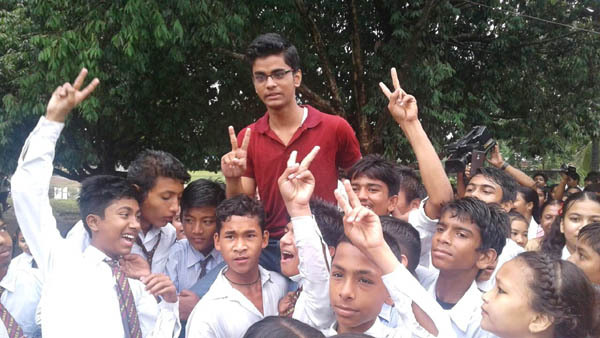 Dhritishman Bhuyan of Ramswaroop Agarwalla Memorial English School, Udalguri has brought glory to Udalguri by securing 6th rank in HSLC examination, the results of which were declaredon Friday. A resident of Nalbari village in Udalguri, born to teacher parents Niranjan Kumar Bhuyan and Beauty Chowdhury Bhuyan, Dhritishman scored 588 marks with 100 percent marks in English. Talking to media a cheerful Dhritishman said,” I aspire to be a physician and serve the society. Although I was hopeful of bagging a rank, I was elated by the high rank. I studied regularly for 8-10 hours besides devoting time to read novels and play Tabla. He exhorted the upcoming generation to construct their lives by debarring themselves from the disturbing elements and vices of the society. He advised the upcoming batches to work hard, which will pay off eventually. He also spoke on the Citizenship Amendment Bill 2016 and appealed to the government to re-consider its decision”. The jubilant students and public took out a procession with the meritorious student. Various organizations and student bodies congratulated him on this feat.